Formation of the Region in 1961. March in Pittsburgh is a busy month. It is a month devoted to readying a stored Porsche for its return to the road, and a month filled with anticipation of the autocrosses, rallies, and the Porsche Parade coming during the summer months. This was especially true in March of 1961. On March 25, 1961, 31 Porsche owners and P.C.A. members gathered at McSorley’s Restaurant in the North Hills for a very special Porsche related reason. The gathering was organized by a relatively recent Pittsburgh resident… Shepperson Prescott Adkins. A South African native, Shep had become interested in automobiles at an early age, having seen the Type C 16 Cylinder Auto Union car race at the South African Grand Prix in Cape Town in 1936. He came to the U.S. in the mid-fifties and after settling in the Boston area, formed the Northeast Region of PCA. A move to Akron, Ohio, in 1959, and sure enough, an Akron Region of PCA was born. The intent of the meeting at McSorley’s had a by then familiar ring, “Let’s start a PCA region!”. The result – Allegheny Region was chartered on April 29, 1961. It certainly was time for there to be a PCA region in the Pittsburgh area. 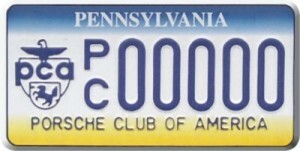 Pittsburgh was the geographic center of PCA membership. As a result, the quarterly National Board of Directors Meetings for PCA were held there. Club Events in Early Years – The Sixties. The first officially staged Allegheny Region event was a picnic at North Park on May 7. One of the highlights of the 1961 event schedule was a photo rally won by the Lepperts, new members from Johnstown. During the early sixties, the membership produced a large turnout at the Connellsville Air Field races and at the famed Cumberland SCCA races. The mid-sixties produced current long time members Ted & Margaret Dixon, Bob & Ella Jean Day, and Dic Sundra. Dic has carried the ARPCA banner into competition in SCCA with a Speedster in the ’60s and a D production 911 in the ’70s. Allegheny Region members had long been Parade attendees, and in 1964 the region won the Parade President’s Trophy, which is awarded each year to the region with the largest contingent of cars at the Parade considering the size of the region and the distance to the Parade. Going into the late sixties, PCA National Executive Council Meetings were still held in Pittsburgh, which gave National Executive Secretary, Jane Nestlerode, an opportunity, having grown up in the Pittsburgh area, to visit with her family. Since 1970, these meetings have been held in various locations around the country to facilitate the attendance of zone representatives and in response to the growth of PCA into a truly national organization. Club Events of the Seventies. The seventies saw the club flourish in both social and competitive events. Jeff Brinker and Roger Schneider were seventh at the 1974 Parade Rally. Wade and Jane Anna Miller continued this tradition in the 80’s by taking a fourth and a second in Parade rallies. Allegheny Region was one of the original 5 regions that in 1976 started the now well known and extremely competitive IRAC autocross series. (At the 1986 Parade, IRAC competitors won 17 autocross trophies. As each was awarded, the large banquet room was filled with thunderous applause and cheers of “IRAC, IRAC” from the many attendees from IRAC regions). ARPCA’s own Bob Nikel was the originator of that series. The first event was held at The Nemacolin Inn. Traditional events started in the sixties and continued through the seventies included the Zone 2 Swap Meet at Donegal’s Big Red Fun Barn, the Dixon’s summer evening dinner in June, and the winter wine and cheese tasting at the home of Jon and Peg Mason. Christmas parties were always a treat too, and ARPCA had their own version of Santa Claus… Michael Barbush. In 1977 the region sponsored a rally to Toronto, and then a tour of that city. In 1980, two traditional events at the family picnic were a bake-off and a Porsche Dog Show. There was an annual tech session held at the, then, Sewickley Porsche-Audi-Alfa where Bob Nikel would instruct, and a dinner would be served, elegantly, in the garage! Events of the Eighties. The eighties brought new enthusiasm into the region with more diversification of events and more participation by new members but with the continuation, although somewhat modified, of the traditional events: The IRAC Autocross Weekend, the Family Picnic and the Christmas Party continued to be some of the years most popular events, the Mason’s wine and cheese party for a while became the Dale and Holly Miller wine and cheese party and is now the February wine dinner at any one of Pittsburgh’s finer wine restaurants. While the highlight of the winter in the early 80’s was the Maurer’s Ski Rally to their condo at Seven Springs, the next winter tradition, the “I Wish I Were Driving My Porsche In July Instead of Freezing My Tail Off In January” Party, recently finished its tenth year at the home of Wade and Jane Anna Miller. Now the “Mid-Winter Party”, held at a local shop keeps the Porsche spirit high during the winter doldrums. Introduction of Drivers Education. An event new to Allegheny Region was started in 1987, the high speed Drivers Education held at nearby race tracks. What started timidly as a one day school and time trials at Nelson Ledges with a lot of work by Ed Boozel and Russ Morse, has blossomed into one of our most popular activities. Since that humble beginning, the club has developed a level of expertise that has made ARPCA second to none in running this type of event. In 1995, the region expanded its range with its first Drivers Ed at the legendary Watkins Glen International Raceway. Our event at the Glen is now over the Memorial Day weekend, providing a great opportunity for a relaxing weekend visit to the Finger Lakes area. In 2002, we added another track to our local list, BeaveRun. BeaveRun is right in our own backyard, just off the Beaver Falls exit of the PA turnpike. Most of us can attend a two day track event and still sleep in our own beds each night! Association with PVGP in Nineties and Forward. A new and lasting tradition started in the nineties with ARPCA’s association with the Pittsburgh Vintage Grand Prix (PVGP). The weekend of racing in Schenley Park features reserved parking, catered lunches, and a concour. In 1994, Porsche was featured as the Marque of the Year. The great work of Event Chairs Hank and Donna Kessler and the Concours efforts of Vince and Kathy Golik helped raise over $10,000 for the PVGP charities, the largest ever from the featured marque. This effort was recognized at the PCA National level with the region receiving third place awards in the Pirelli Community Service Awards contest. However, records are made to be broken. 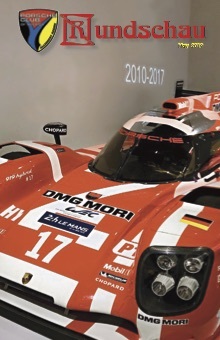 In 2002, Porsche was once again the Marque of the Year. Again with the help of Hank and Donna, with support from Clark Hamerly, our president at the time, we got Porsche Cars North America involved (with the help of a letter from Ted Dixon, long time friend of the Porsche family) with the event. With PCNA’s help along with getting a lot of other sponsors on board, the donations grew to $56,100. Close Ties to National PCA Organization. Allegheny Region continued its close ties to the National PCA organization through the eighties and into the nineties. Dale Miller served as the PCA National Historian, storing and sharing a wealth of information on the history of Porsche cars as well as the Porsche Club of America. In 1989, Dale passed that responsibility on to another person of Allegheny Region heritage, Ted Zombek, who still holds that office today. Club Racing Added in 2003. Another new event for Allegheny region started in 2003 with the Region hosting its first-ever PCA Club Race at the then-new BeaveRun track. Steve Scholze and Bruce Graham put together a large group of volunteers to ensure that this first attempt at running a race event lived up to the Region’s tradition for excellence. The race was a huge success but scheduling difficulties led to a lack of opportunity to continue and grow the Region’s involvement in hosting PCA Club Races. Interest in Porsche Club Racing remains high within the membership and there is a continuing “buzz” among the ranks that the opportunity will arise to continue what was a great start.